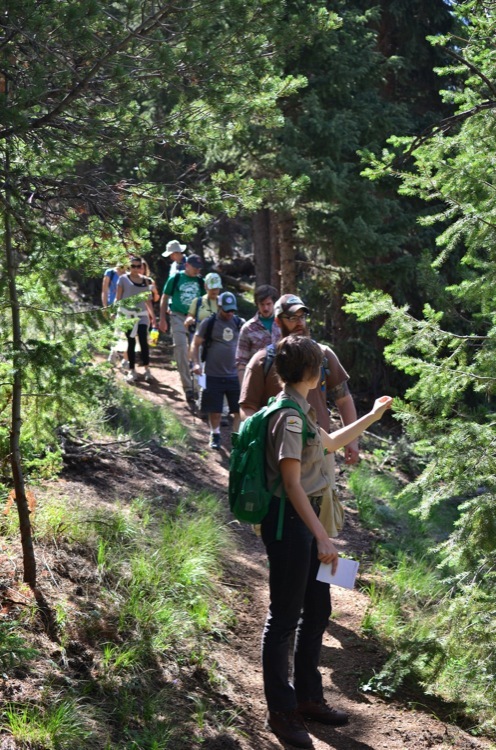 Last month, before the first Beers Made By Walking tasting, we had our fourth hike at Mueller State Park. 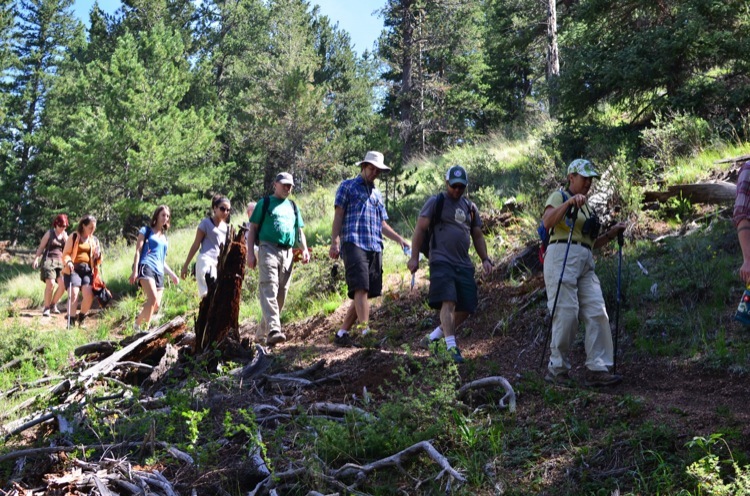 The hike was led by Kimberly Banzhaf, who works at the park, and has led a number of our other hikes. 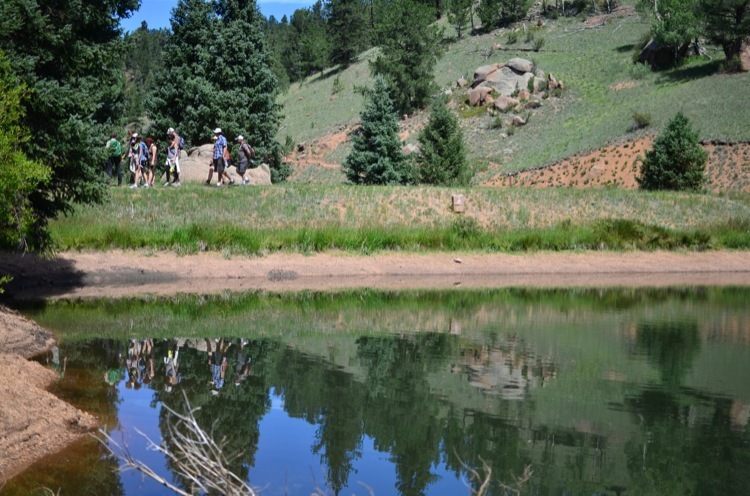 The homebrewer on this hike was Scott Buchholz, who recently won five medals at the State Fair Homebrew Competition, and who makes one super tasty Kölsch style beer. 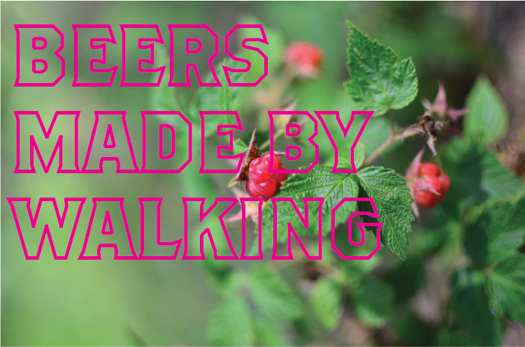 In case you are not yet familiar with the BMBW program, we go on a series of hikes, identify edible plants, and then make a beer based off what we see along the way. The first four beers have already been tasted, they were brewed commercially at Rocky Mountain Brewery. The next four beers will be made at Pikes Peak Brewing in Monument, one of the newest breweries in the state, and a very exciting brewery at that. The beers will be available to the public at Brewer’s Republic, downtown Colorado Springs, on Oct 29th starting at 4pm. I had not visited Mueller State Park previous to this day, but the park certainly exceeded my expectations. If you haven’t made it out there yet, you should, because it’s a beautiful park with hikes that go around small lakes and through some hills. There are a lot more pine trees than there are in some of the hikes we’ve done in the city and the environment was a lot more lush than what we are used to here in the Springs area. We started the hike heading downhill, knowing that we’d be climbing a good distance back uphill. 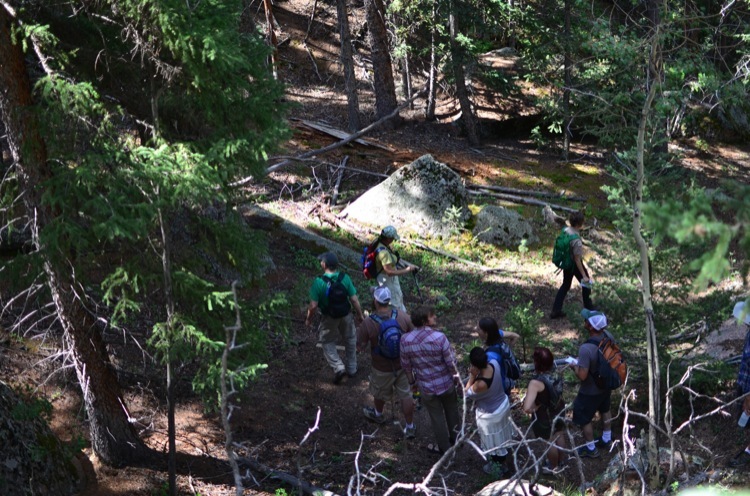 We passed little streams, lots of trees, and identified some yarrow, bluebells, limber pine, onion, and others. 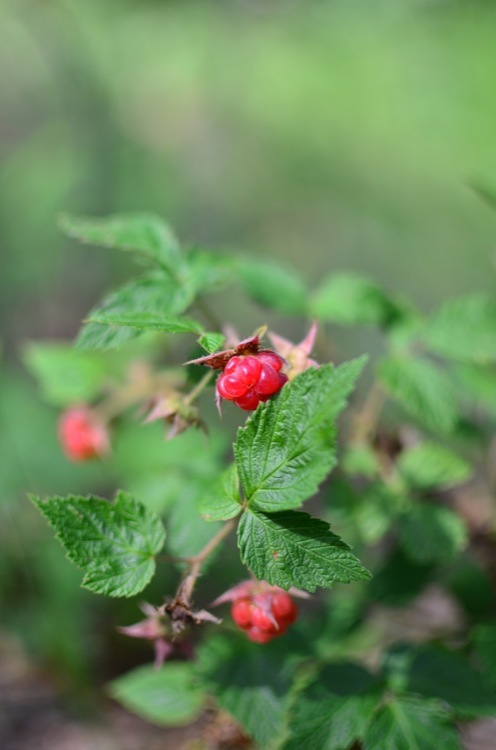 At the bottom of the hill were a couple lakes where we saw some wild strawberries, raspberries, bear berries, and a whole bunch of currants. Here’s a nice picture of Scott, our homebrewer for this hike. He’s busy sniffing flowers. As it turns out one of the hikers had brought some dried strawberries to munch on. After seeing some strawberries near the trail Scott thought that a strawberry beer was in order. We ate some of our fellow hiker’s strawberries while also sampling some needles from the Limber Pine and ended up really enjoying the combination of flavors. The Limber Pine imparted an orange citrus taste, along with a more subtle pine flavor that you would normally think of when you think of pine needles. So, Scott decided to brew up a blonde ale with strawberries and limber pine. I wasn’t able to make it to his brew day so I don’t have photos of it, but this is a beer you can for sure look forward to. Scott’s Strawberry Blonde with Limber Pine will be available in limited quantities at Brewer’s Republic, only on Oct 29th from 4-8pm. There are 3 more beers that will also be available at that time, served on sampling trays that I built. Big thanks to Pikes Peak Brewing for making this possible, the beers are produced as commercial products at their brewery. Stay tuned for information on those other beers and if you need convincing that this will be a worthwhile tasting, see the image recap from the first tasting here.